"We discourage people from walking over hot coals." When the usual year-end lists come out in December, I hope this will make it into the "Ten Best Quotations of 2012." It comes from Reggie Williams, captain of the San Jose Fire Department, commenting on the 21 people who were treated for burns following their barefoot walk over hot coals in a Tony Robbins "Firewalk Experience" event there in July. What went wrong? Interviewed by the San Jose Mercury News while recovering from his burns, participant Andrew Brenner said that he "...didn't get into the right state and got burned. I knew I wasn't at my peak state." Peakness, in this case, involves visualizing the hot coals as cool moss. Not getting burned, apparently, is a matter of "right attitude." So not getting burned when I put my hand into a hot oven must be due to my positive disposition, which presumably turns negative (instantly!) if I touch anything in the oven. Seriously folks. We're looking at basic physics. The reason I don't feel pain in the 400-degree air of the oven, or that (most) firewalkers don't get burned is that there's virtually no energy transfer between the air/coals and skin. Skin, whether on hand or sole of foot, is mostly water; hot coal is mostly air. The "specific heat capacity" of water is about four times that of air (4.18 vs. 1.01 joules/degrees Kelvin-gram). A body's specific heat capacity determines how fast it will heat up or cool down when in contact with a hotter or cooler body. Oven mitts, for instance, insulate well due to their high specific heat capacity. The specific heat capacity of well-burnt hot coal is nearly the same as that of air. So firewalkers don't get burned because very little energy transfers from the hot body (coal) to the cool body (feet). Kjetil Kjernsmo, a curious and brave physicist from the University of Oslo, proved this for himself a few years ago, while setting a new record -- 230 feet -- for length of fire walked. He arranged for an infrared camera to record the temperature of the coals immediately before and after walking across them with bare feet. Even though the camera could register very small temperature differences (0.1 degree K), he saw no discernable difference, proving that negligible energy was being transferred from coals to feet. He also surmises that any heat energy that is transferred to the soles quickly dissipates, thanks to the rich flow of (high thermal conductivity) blood in our feet. 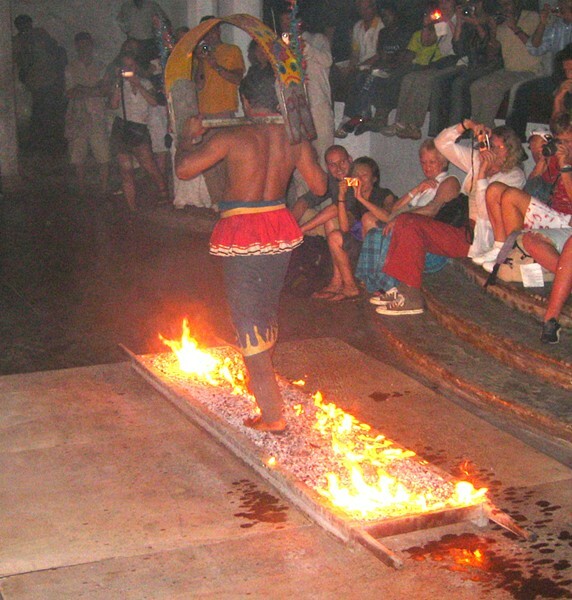 So the keys to firewalking are: (1) don't linger (the thermal conductivity of the coals will eventually "catch up" to your skin); (2) don't run (you'll push too deep into the embers, exposing the sensitive skin on top of your feet); (3) do wait for the coals to burn thoroughly (coals contain water, which increases both their heat capacity and thermal conductivity, so you want the water to be completely evaporated before prancing on them). I'm betting they neglected that last one in San Jose. Barry Evans (barryevans9@yahoo.com) would take the challenge if the opportunity presented itself - after checking the coals had burned for a goodly long time.